A sit-stand desk is a desk that can adjust in height, giving employees the option to either sit or stand while they’re working. When you provide each of your employees with a sit-stand desk from NorthPoint Office Furniture, you will be showing them that you care about both their health and their happiness. That’s because not only has standing for part of the day been linked to a decrease of certain health risks for employees such as heart disease and diabetes, but its also been linked to an increase in their activity and focus levels. It’s also important that your employees are able to sit when they get tired, making sit-stand desks the perfect option for your Atlanta, GA, area office. At NorthPoint Office Furniture we have a large 8,000-square-foot showroom where you will be able to see, feel, and compare our sit-stand desk options so you can visualize how they will look and fit into your existing office space. Plus, when you come to our showroom you can speak with one of our knowledgeable and helpful employees who can answer any questions you might have and be able to recommend the right sit-stand desk options that meet both your needs and your budget. What’s more, our prices include free assembly of your furniture, so once your new desks arrive at your office, we can assemble them quickly for you so your employees can get right to work. 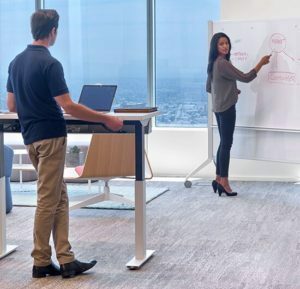 To learn more about the sit-stand desk options, as well as the other types of office furniture we have available to business owners throughout the Atlanta, GA area, contact NorthPoint Office Furniture today.